In this file photo released by The Public Theater, Lin-Manuel Miranda, foreground, performs with members of the cast of the musical "Hamilton" in New York. In the song "A Winter's Ball" in the smash Broadway hit "Hamilton," Aaron Burr's character sings of Alexander Hamilton's delight for women, including the tale that Martha Washington named her feral tomcat after him. 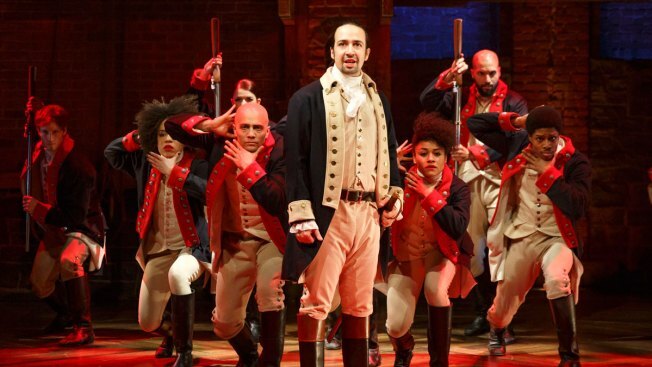 "That's true," Lin-Manuel Miranda's Hamilton character tells the sold-out theater each night. But it's not, according to a group of Hamilton enthusiasts and researchers gathering in New York and New Jersey this week. Twenty miles from the Broadway theater where fans spend thousands of dollars to see the show, a group dedicated to studying the nation's first treasury secretary will gather Thursday to unveil new artifacts and retrace a piece of history they hope can soften some of Hamilton's rough edges. They believe the tomcat story and talk of Hamilton's relationship with women have been used through the years to undercut what they say was his vital work for the country. Phoenix-based Hamilton researcher Michael Newton says it's an issue of fairness. "If you're saying Hamilton was this scoundrel, all of a sudden it colors your view on his position on politics and economics," Newton said. That Hamilton had at least one affair isn't in doubt. He wrote a 95-page pamphlet on his affair with Maria Reynolds, which heavily damaged his reputation. That plus a very friendly relationship with his sister-in-law plays a big part of the Tony award-winning musical that has become a cultural phenomenon and created a larger audience of people looking to learn more about him. The tomcat story is included in multiple biographies of Hamilton, including the Ron Chernow book that the musical is based on. In "Hamilton: The Revolution," co-authored by Miranda, the song's lyrics include a footnote that says the line was "most likely a tale spread by John Adams later in life" but that Manuel included it because he likes "Hamilton owning it." "At this point in the story," Miranda writes, "he is at peak cockiness." Newton and fellow Hamilton researcher Stephen Knott both say they haven't found evidence of Adams spreading the tale and instead trace the story to a satirical letter from someone described as a British captain republished 56 years after Hamilton's death. Newton says that what apparently started as a joke about Martha Washington naming her cat after Hamilton "in a complimentary way" morphed through the years to biographies stating she named her tomcat after him to comment on his reputation. Newton points out that dictionaries note that tomcat only meant a "male cat" in the 18th century and didn't carry its other connotation - a promiscuous man - until later. Chernow, who only touches on the story in his 800-page book with half of a sentence, didn't respond to emails seeking comment. Joanne Freeman, a history professor at Yale, said she's always assumed the tomcat tale wasn't actually true. She said that people should understand that not everything in the show is accurate, but that it's good that it's gotten people to ask questions. "People should think and evaluate and not necessarily instantly accept stories whether it's on the stage or wherever they get it from," she said. "The play is getting people to ask a lot of questions about Hamilton and history. (Miranda) would be very happy." The Hamilton researchers, part of the Alexander Hamilton Awareness Society, on Thursday also will unveil what they say is the original copy of Hamilton's half brother's will and letters about Hamilton and his wife's dealing with a yellow fever outbreak. Both were found in the files of John Kean, part of one of New Jersey's most prominent families. Hamilton lived at the former home of New Jersey's first governor, William Livingston, and it is now a museum on the campus of Kean University.